The NBA continues to emphasize shots from beyond the arc, but the midrange game still drives the scoring output of some of the league’s best players. The recent trend of NBA offenses seems to be geared to more shots from three-point range and more shots at the rim. This new emphasis has led to a steep decline in the frequency of midrange shots. In the 2006-07 season, the Minnesota Timberwolves led the league in midrange scoring, with 29.9 percent of their points coming from that range. 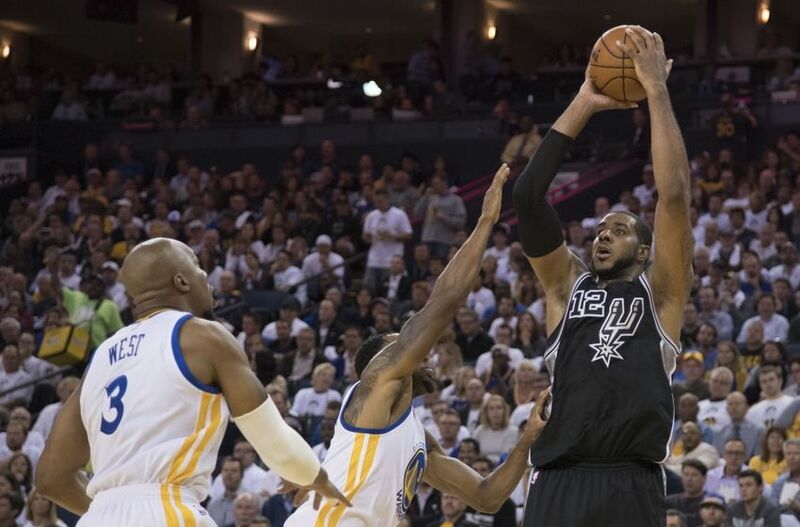 This year, the league-leading San Antonio Spurs score just 20.6 percent of their points from that range. Evan Turner declared that “the future is in the midrange” back in June, but he remains an outlier in that regard. Nonetheless, some of the NBA’s most effective scorers are able to capitalize on those shots. As defenses focus more and more on pushing players away from the three-point line and into the midrange, these players will find more opportunities to punish defenses in between the rim and the arc. 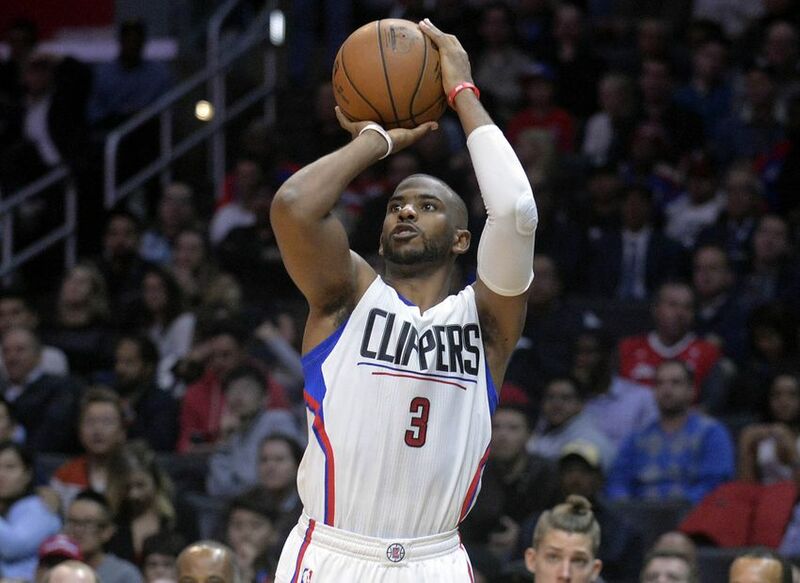 Here are the 10 best midrange scorers in the NBA. A number of big men with good jump shots have moved beyond the three-point line this season. LaMarcus Aldridge, however, has kept his shooting inside the arc. Aldridge is currently averaging 7.6 attempts per game from the midrange area, tied for fourth in the NBA according to NBA.com’s shot tracking data. He converts those looks at a solid 41.1 percent. Aldridge has been a midrange killer for a while, but his shot attempts from that range have shifted since his arrival in San Antonio. In Portland, Aldridge generated many of his shots from the high post on face-up or fadeaway jumpers. He was assisted on 57.8 percent of those shots in his last year for the Portland Trailblazers. 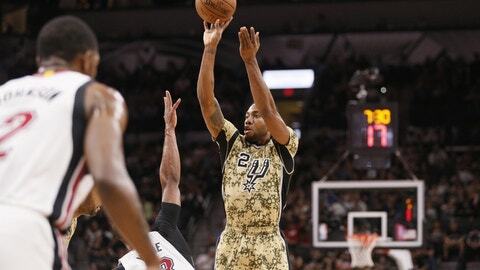 In San Antonio, Aldridge has gotten most of his shots out of pick-and-pop jumpers or spot-up looks from midrange. He has been assisted on 67.8 percent of his midrange shots this season. Last year, he received assists on 78.5 percent of those looks. LaMarcus Aldridge continues to thrive from the midrange, even if he is no longer the perennial All-Star he was in Portland. He has taken 219 of his 406 shots this season from that range (53.9 percent). He is still a threat from inside the arc for a Spurs team that leads the league in midrange offense. 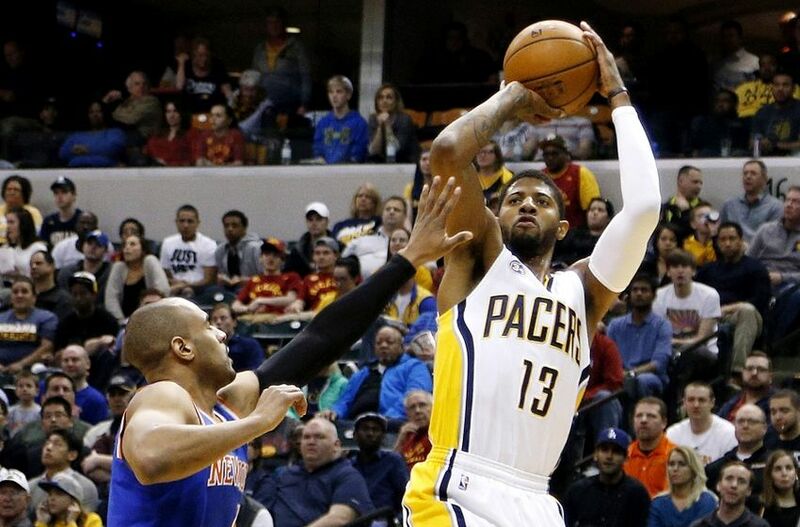 The Indiana Pacers and Paul George might be having a down year, but George is still one of the best midrange players in the NBA. George is currently eighth in the NBA with 6.6 midrange attempts per game and is hitting a solid 43.9 percent of them. George is particularly effective on pull-up jump shots from midrange. He is shooting a remarkable 62.3 percent on those looks according to NBA.com’s shot tracking data. Those looks only represent 31 percent of his midrange shots overall, but are still a huge factor in his scoring. George’s height advantage over most forwards allows him to simply shoot over people on drives if opponents sell out to protect the rim. Paul George’s ability to score in the midrange area is mostly due to his solid jumper, as he is not much of a post player. His efficiency on jump shots from inside the arc and outside the paint drives a lot of his scoring. 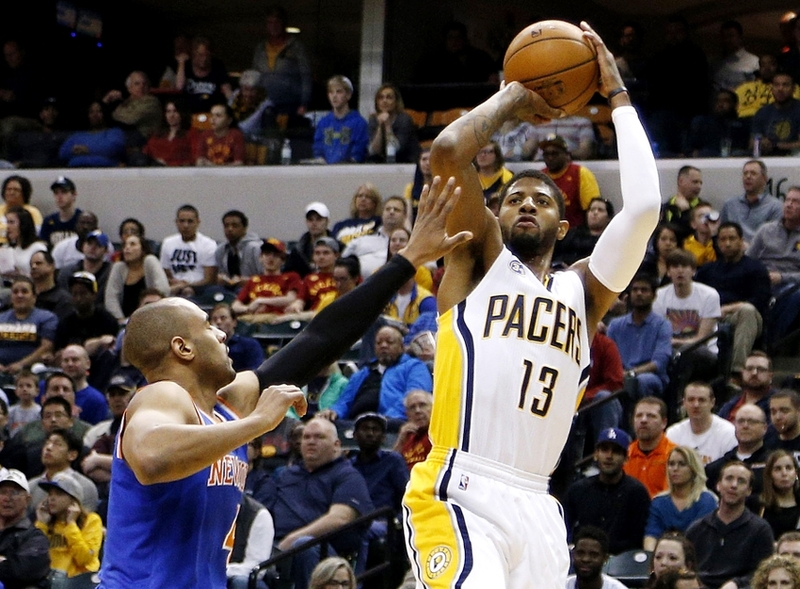 The Pacers rely heavily on George for their offense, and his solid in-between game is a large part of that. Kawhi Leonard is another brilliant midrange scorer, and his pairing with LaMarcus Aldridge drives much of the Spurs’ success from that area. Leonard has improved his scoring average every season and is averaging a career-high 24.4 points this year. Kawhi is shooting 45.7 percent on midrange shots and is taking 6.0 attempts per game from that range. Like the next player on this list, Kawhi is responsible for creating the majority of his looks in the in-between game. Just 36.5 percent of his midrange shots have come from assists this season per NBA.com’s shot tracking data. Leonard has been the unquestioned focal point of the Spurs’ offense this year, and much of that offense has come from his midrange game. Kawhi has attempted more of those shots than either three-pointers or restricted area shots this season. 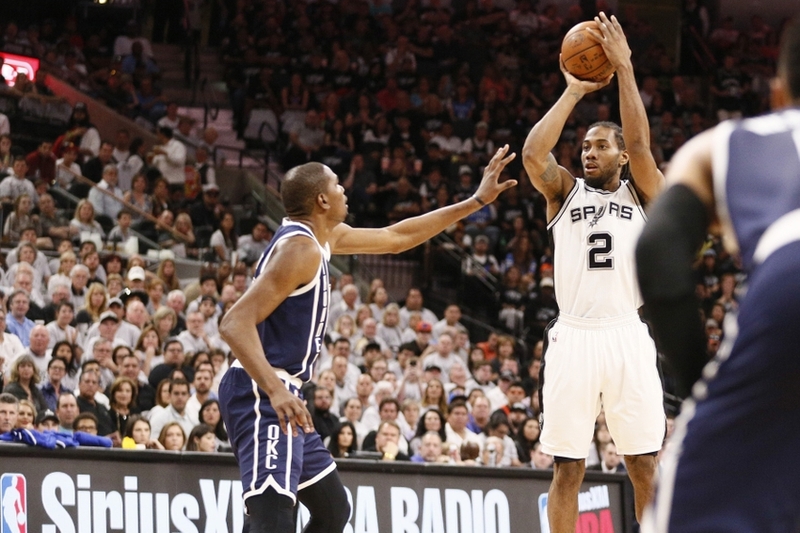 Kawhi has a varied repertoire of shots in the midrange area, which allows him to score effectively in isolation. In addition to making a solid percentage of his open jumpers from inside the arc, Leonard has also developed a strong pull-up jumper and a deadly fadeaway jumper. Leonard has made 50.0 percent of his pull-up jumpers this season and 58.8 percent of his fadeaway jumpers this season. His ability to score in the midrange both in the post and off the dribble makes him one of the better midrange players in the NBA. Cleveland Cavaliers star Kyrie Irving is a great scorer from nearly anywhere on the floor, and his midrange game is no exception. Irving averages 5.5 attempts per game from midrange and converts on 45.8 percent of them — third-best among players with five or more attempts per game per NBA.com’s shot tracking data. Instead of relying on a height advantage to create space, Irving instead uses his fantastic handle to create looks for himself. Only 25.7 percent of his midrange looks have been assisted per NBA.com’s shot tracking data. His ability to find open space off the dribble allows him to make room for a jumper against taller defenders like Thompson. Irving has canned 54.5 percent of his step-back jumpers from inside the arc. That play is just one of the many ways that Kyrie uses his incredible dribbling skills to create open looks. He is a fantastic scorer from all areas of the game, and one of the best midrange players in the NBA. 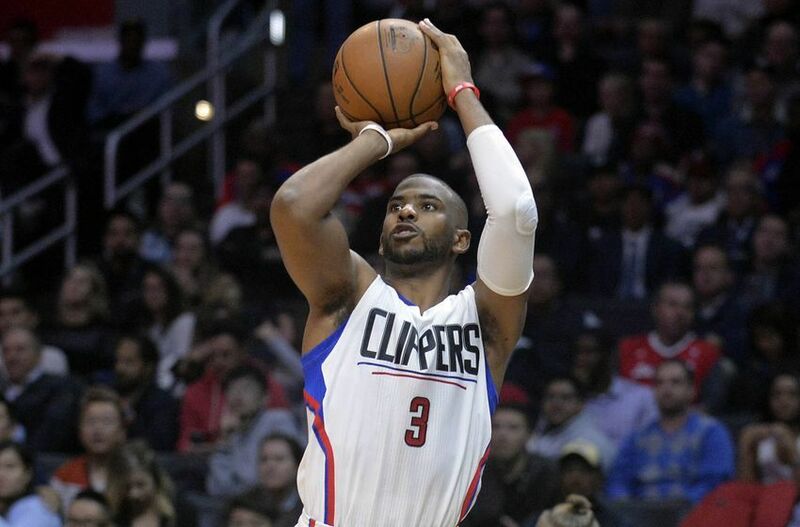 The Los Angeles Clippers have relied on the midrange excellence of Chris Paul for a while now, and this year is no different. Paul is averaging 4.8 attempts per game from the midrange, the fewest of anyone on this list. However, he is also shooting a stellar 47.3 percent on those looks. More remarkably, he has been assisted on a paltry 7.1 percent of those shots this season per NBA.com. Thirty-three of Chris Paul’s 70 makes in the midrange area have been pull-up jump shots per NBA.com’s shot tracking data. Additionally, Paul has connected on 58.1 percent of those pull-up attempts. Few players can prevent him from finding an opening for that shot. Once he has dribbled his way into space, Paul is deadly from midrange. He might not take as many shots as some of these other players, but Chris Paul continues to be lethal in the midrange game. The Golden State Warriors are one of the teams on the forefront of the three-point revolution, but that has not stopped Klay Thompson from being effective in the mid-range game. 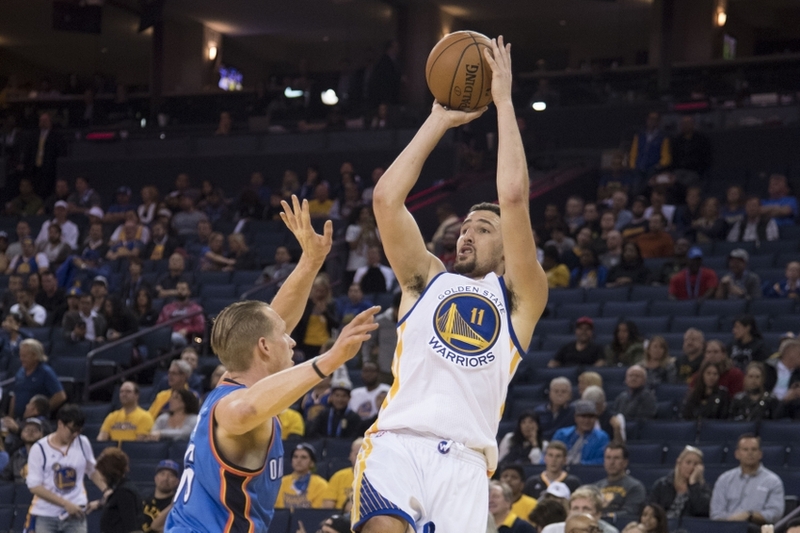 Thompson averages 5.0 midrange shots per game according to NBA.com, second-fewest on this list. However, he has been on fire from that range, hitting 49.4 percent of his midrange looks — best in the NBA among players averaging five or more midrange shots per game. 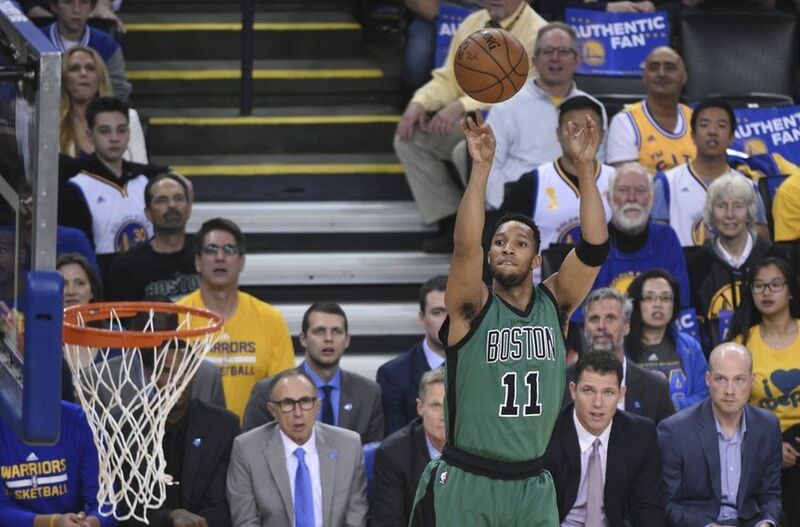 Thompson is a pure shooter and his midrange game reflects that. 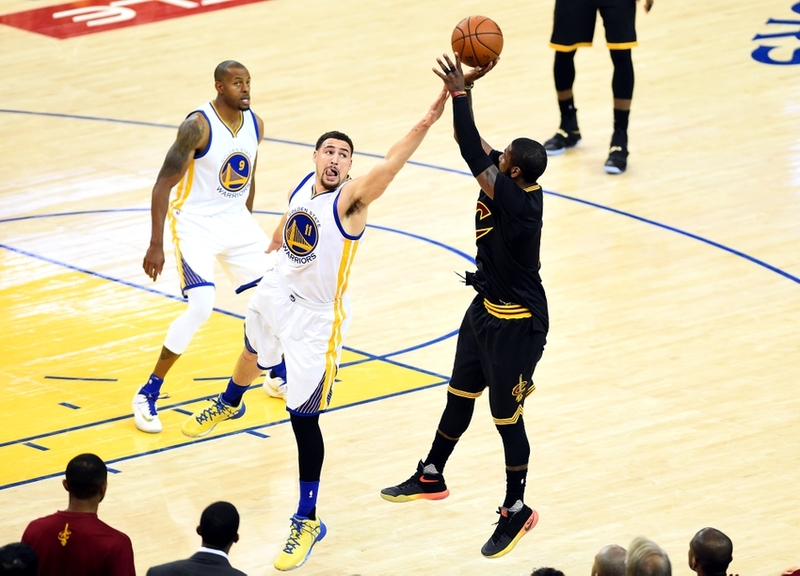 Klay has been assisted on 78.0 percent of his midrange looks. He does not have the ball-handling ability of most of the guards on this list, nor the post-up or face-up skills of the big men. Instead, his midrange game is driven by the same force that drives his offense as a whole. 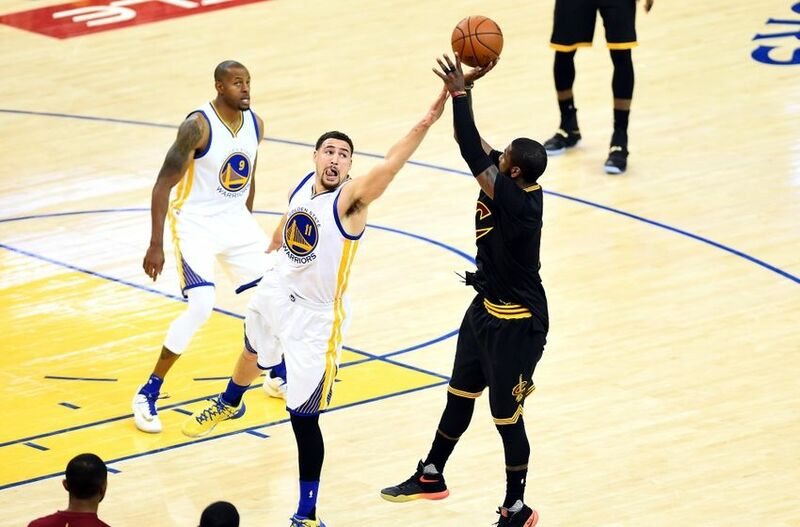 His teammates are clearly a factor in his scoring ability, but few players can match Klay’s picture-perfect jump shot. Even fewer players can work around screens to get open and then immediately rise and fire as effectively as Thompson can. Klay might not have the varied midrange repertoire of some other players on this list, but few can argue with the results. 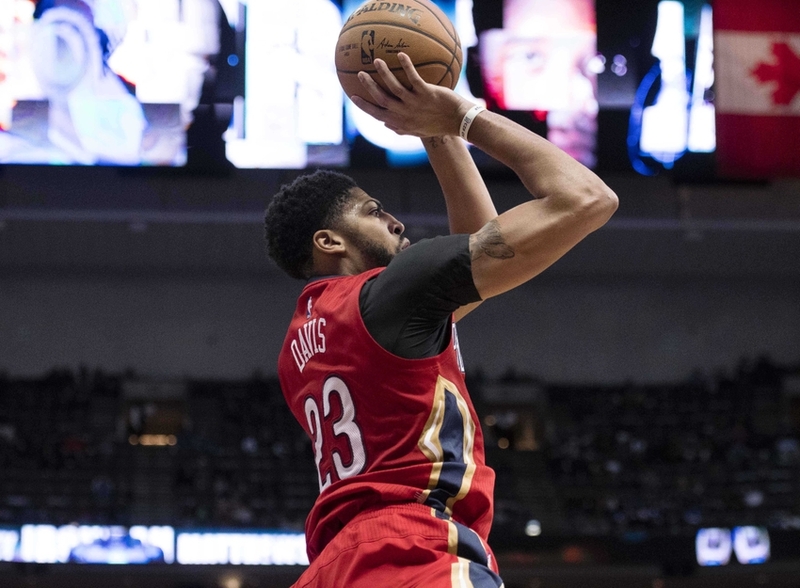 Anthony Davis carries one of the larger offensive burdens in the league, and he and the New Orleans Pelicans lean heavily on his midrange game. Davis attempts the second-most shots in the league from that area with 8.5 per game. He converts on a solid 42.4 percent of those looks, despite being the main focus of every defense he faces. Davis has one of the more varied midrange repertoires of any of the players on this list. He is able to face up and shoot over other big men. He can run pick-and-pops for wide-open jumpers as defenses scramble to prevent him from rolling to the rim. His post-up game, nearly non-existent in his first season in the league, has evolved to the point where he can score in both the high and low post. The Pelicans need Davis to carry their offense, and Davis, in turn, needs his midrange game to score effectively. 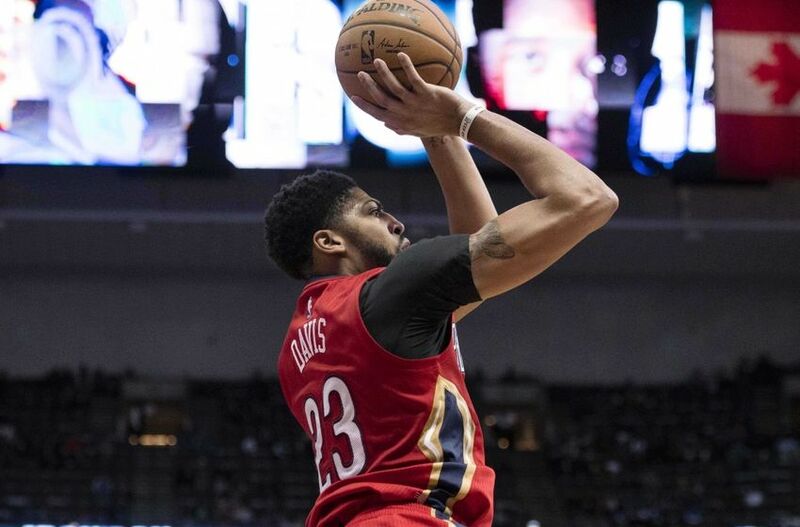 Many people may look at the Brow as an incredible lob dunker and finisher at the rim. However, his diversified midrange game should not be ignored. Davis would not be the offensive force that he has become without his elite ability to score in that area. It seems somewhat premature to rank a player as young as C.J. McCollum as the third-best midrange scorer in the NBA. However, it is hard to argue with his volume and efficiency. McCollum averages 5.8 attempts per game from that area and converts on 49.0 percent of them–just barely behind Klay Thompson for second-best among players with five or more attempts per game. Many of the best midrange shooters in the game are on that list, but only Klay stands above McCollum’s efficiency. 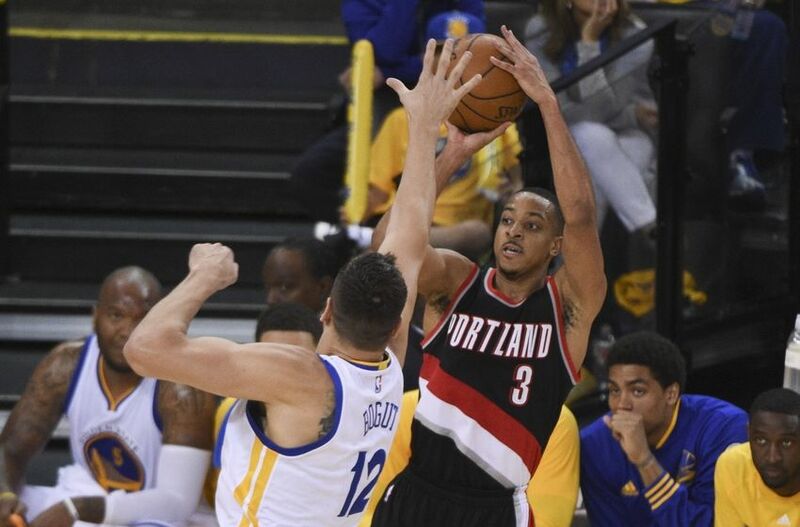 Unlike Thompson, however, McCollum is generating most of those looks on his own. Only 32.3 percent of his midrange baskets this season have been assisted per NBA.com’s shot tracking data. McCollum is undersized for a shooting guard at 6’3″ so he has to use his dribble to create open looks. He has a solid step-back jumper, as he converts 55.0 percent of his step-backs from inside the arc. He also converts his floating jumpers at a ridiculous 65.2 percent rate. C.J. McCollum has knocked down 51.8 percent of his pull-up jump shots from inside the arc. More than half of his 96 midrange makes have come from pull-up jumpers. C.J. has made 51 pull-up jumpers this year from the midrange as of Thursday per NBA.com’s shot tracking data. McCollum is not a newcomer to the midrange fraternity either; he attempted 5.8 midrange shots per game last season as well and canned 44.6 percent of them. C.J. McCollum is only a fourth-year player, but he can already score in the midrange with the best in the game. 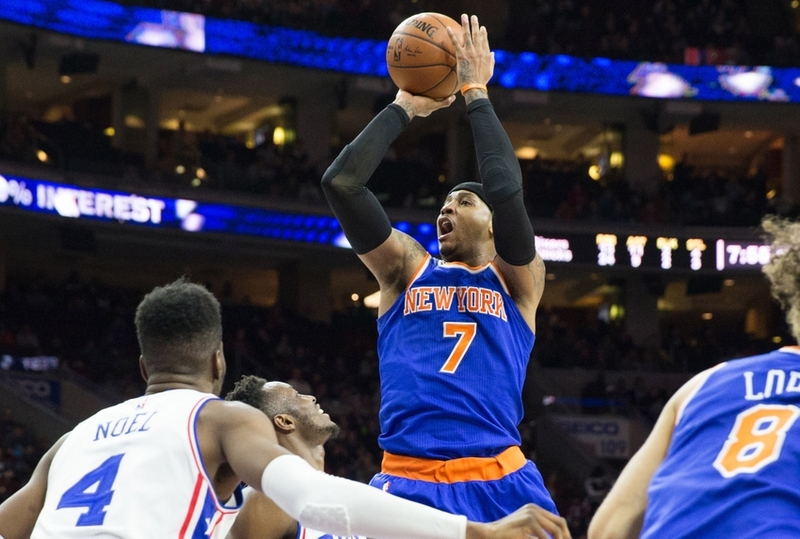 Carmelo Anthony is no longer an MVP candidate for the New York Knicks. Some might even argue that he is hurting the development of rising star Kristaps Porzingis. What cannot be argued, however, is that Melo is still one of the league’s best midrange scorers. He is taking the third-most attempts per game from that range with 8.4 per game and is making 43.4 percent of them, per NBA.com. 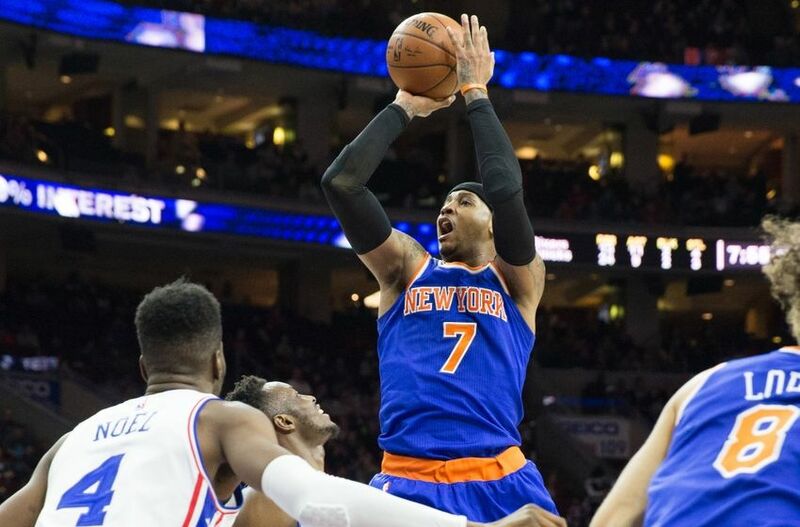 Melo is primarily an isolation scorer and his scoring in the midrange is no different. Anthony has been assisted on only 30.3 percent of his midrange looks. That number is around the level that would be expected of a high-usage point guard, not a 6’8″ forward who often looks best as a rangy power forward. Michael Kidd-Gilchrist may be one of the league’s best defenders, but he is no match for a Carmelo fadeaway from the right block. With Dirk Nowitzki sidelined with injury for much of this season (which has unfortunately bumped him off this list for now), Carmelo Anthony has become the king of the old man midrange game. However, Melo must cede his throne to the true king of the midrange — one who looks like he will hold the title for years to come. 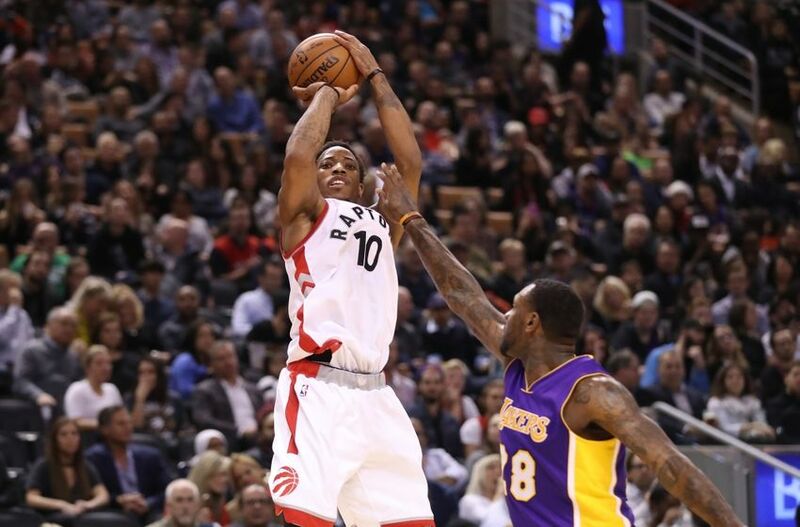 DeMar DeRozan of the Toronto Raptors is the best midrange scorer in the NBA and it would be difficult to argue otherwise. DeRozan leads the NBA with 10.0 midrange attempts per game. The gap between DeRozan and Anthony Davis is almost as large as the gap between Davis and seventh-ranked Andrew Wiggins. DeRozan has matched his high frequency by making 43.3 percent of those midrange looks. For reference, his 319 midrange attempts out-pace an entire NBA team — the Houston Rockets have attempted 248 midrange shots this season. DeMar has essentially every midrange shot in his arsenal. He has the pull-up jumper down, making 51.4 percent of his 144 pull-ups inside the arc. He has the regular fadeaway and has knocked 10 of his 16 attempts. The step-back is there too–DeMar has made 12 of 24 of those inside the arc. His turnaround jumper is a thing of beauty, and he has made 19 of 29 turnarounds this year. He can even mix and match his various midrange shots–DeMar has converted 14 of his 27 turnaround fadeaways as well. 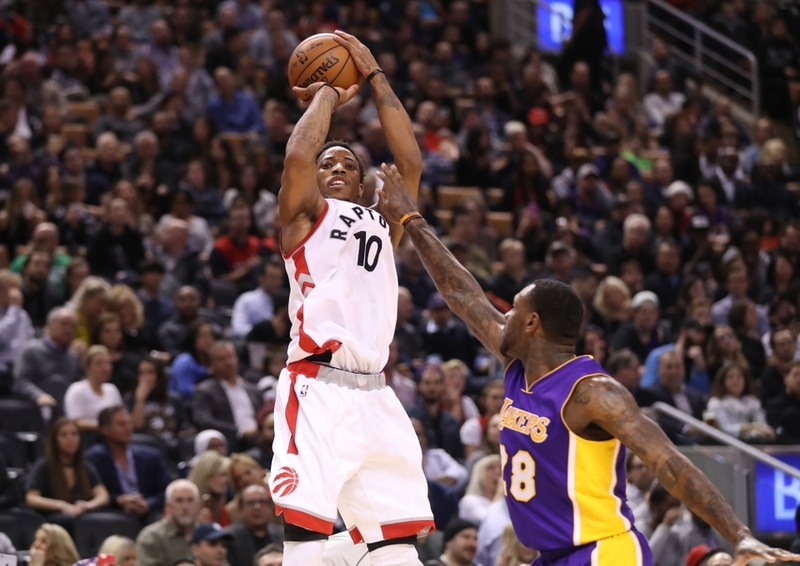 The NBA has many great midrange scorers, but none of them can match the volume or skill-set of DeMar DeRozan. At just 27 years old, DeRozan may reign as the king of the midrange game for many years to come.